Our Intrepid Tours are designed for active people who want to spend more than one day exploring; to really get into the heart of Wadi Rum. The tours feature a combination of activities and levels of difficulty. They start on the first day in the morning (9-10am) and usually finish on the last day in the afternoon or on the last day after breakfast. All these tours are very flexible and can be extended or shortened to include extra nights/ days or to finish earlier. This tour Is a great way to get a taste of everything during your visit. It includes, scrambling, a Jeep tour, Pure hiking, a great view (from the highest mountain in Jordan), a Camel trek and 2 nights Bivouac Camping. The whole protected area is included in some way, and the tour can also be tweaked to include extra nights, or without a Camel trek, or with extra hiking, as you feel will suit you best. I think what I loved most about the Desert Soul tour, is it really felt like we did Wadi Rum justice. We scrambled, hiked with no Jeep or person in sight, we did a Jeep tour and ticked off the ‘sites’, we tried the Camels, what an amazing creature! We spent each night under a blanket of stars. I don’t think we missed a thing! Magical, fun, this tour has it all & I would recommend it to anyone who really wants to get under the skin of Wadi Rum. Many thanks to Mehedi and your wonderful team! 3 day, 2 nights. Combination tour. 5 day, 5 night Pure Hiking Tour. This is a great tour for people who want to take the time to explore the desert on foot, and for people who really want to escape from modern life. This tour is at the pace your feet take you, discovering the desert free from the noise of a Jeep (or Camel). The scramble up to the Burdah Arch is included. You spend each day hiking with your guide through the landscape: slowly unveiled before your eyes. The circular hike starts and finishes in Rum village. One night being spent in the Camp, and four nights Bivouac Camping. 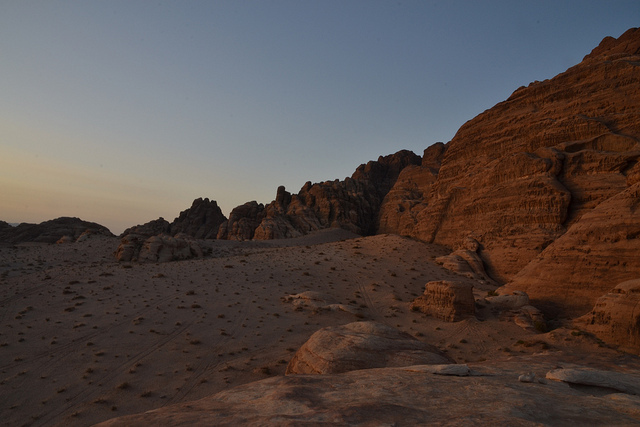 We have always been a walking family, and we wanted to take the time to walk in Wadi Rum and avoid the usual tourist trail. We took Mehedi’s Desert Heart tour, and it was the right one for us. It is really something, just taking your time, and discovering the desert under your own steam. The time spent in the middle of the day resting in the shade, the children playing cards with the guides, the nights spent around the campfire, and the landscape! Wow is all I can say. I was in Valentinas’ group of 7 people, hiking in Wadi Rum with Eid the guide and Ibrahim the driver/chef..
Just wanted to express my gratitude for the amazing organization of the trip. I will defiantly recommend this tour to other people! This tour option is a budget option and a ECO tour. It is for nature lovers, fit, active people and those that like the simple life. The tour is very flexible and can be taken over 1 day - 3 days. It focuses on exploring the desert on foot. You are based in the Camp each night, the Jeep use is minimised and therefore the price can be kept low. We had a wonderful time in Jordan, thank you and we are back home safely now. Wadi Rum was a major highlight of our trip and you all made us feel so welcome at Bedouin Directions! Thank you for recommending the Pure Hiking tour, it suited us perfectly, and our budget too!